This download is for a multisyllable Long A words worksheet which includes practice with the following sounds: a, ai, ay, a-e, ei. Can be used for practice, homework, or assessment. This download is for a worksheet to practice spelling, writing, and reading words with the following Long E patterns: ee, ea, e, ei, ie, ey, y.Can be used for practice, homework, center time, or as an assessment. 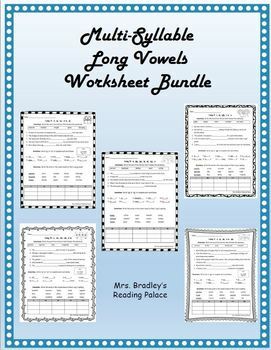 This download is for a multi-syllable Long I words worksheet which includes practice with the following sounds: i, ie, igh, i-e, and y. Can be used for practice, homework, or assessment. This download is for a multisyllable Long O words worksheet which includes practice with the following sounds: o, oa, ow, o-e, oe. Can be used for practice, homework, or assessment. This purchase is for 5 Long Vowel worksheets. There is one worksheet that focuses on a Long Vowel sound and works on the many patterns within that vowel. Save $1.50!! All five worksheets individually would cost $5.00, but get all 5 for $3.50!